I needed an item preferably a scarf to promote the new Kid’s Crochet classes at an event at the store where I teach. I came up with the Crayon Link Scarf pattern. The scarf was a huge hit with the kids. They loved the bright colors and many different ways they could wear it. Some options on how to wear it is as a scarf, mobieus, necklace or belt. I am sure there are many other ways to wear it too. 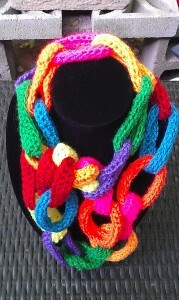 Color options include all one color or each link a different color. It’s a great way to use your stash. The scarf works up quickly and the length can be adjusted by the number of links that are connected. Another option is to connect the end links and turn it into a mobieus. Finish off. For each link after the first link, loop chain on round 1 through previous link before making the slip stitch. Need help while crocheting? Feel free to leave a comment or question below and I will get back to you as soon as possible! This entry was posted on Saturday, December 28th, 2013 at 12:00 AM by Laurie Beranek	and is filed under Free Crochet Patterns. You can follow any responses to this entry through the RSS 2.0 feed. You can skip to the end and leave a response. Pinging is currently not allowed. I can see why it was a BIG HIT that is such a perfect idea & so colorful, girl you have talent. Keep up the great ideas!!!! Thanks, I am happy that you like my patterns. I love color, so many of my patterns have a lot of color in them. Thanks for this unique idea. I certainly will give it a try. An addition of varigated yarn would give a different look. My friend Becky knitted a similiar scarf/necklace for me. There is about 8X5 inches of flat knit at the back and 6-8 long loops connectiong the two scarf sides around the front to form a layered necklace. It is nice and warm. I wore my crayon link scarf out out lunch with a friend today. One of the diners came up to me to say she just had to come over and say how beautiful my scarf was, did I make it and where did I get the idea. I used all my left over Vanna yarn crayon colors from an afghan I made for my new grandson Henry. It’s a winner! Thanks for sharing the pattern. I am so happy that you liked my pattern and it was such a hit. Your more than welcome, I love sharing my patterns with others.